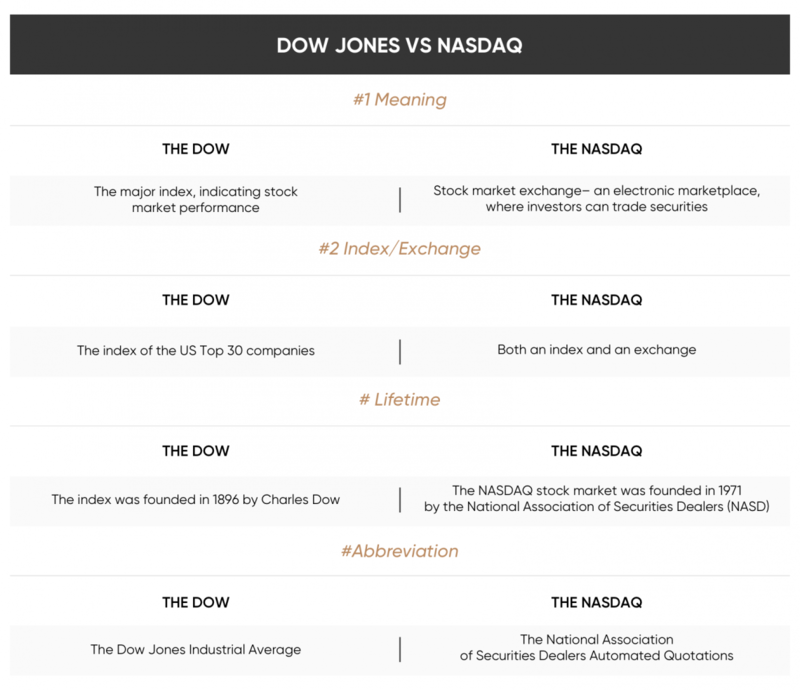 ﻿ What is the difference between the Dow Jones and NASDAQ? Phrases like “the Dow” and “the NASDAQ” are all around when we talk about the stock markets. They’re used so often by the media and industry experts that people lose a clear vision of what each term really means. 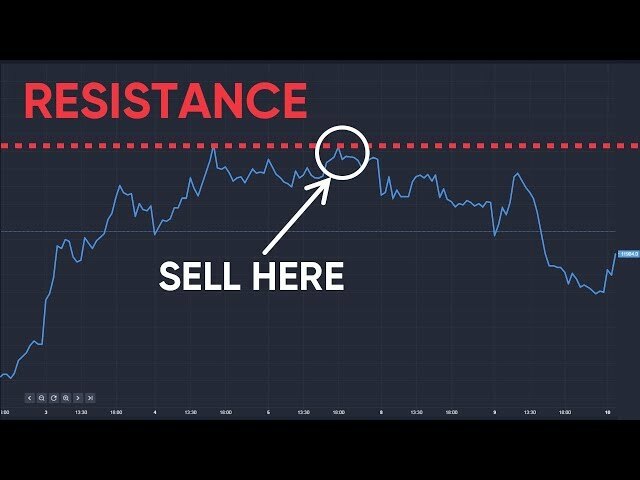 What is the Dow Jones? The Dow Jones, or the Dow, refers to the Dow Jones Industrial Average. 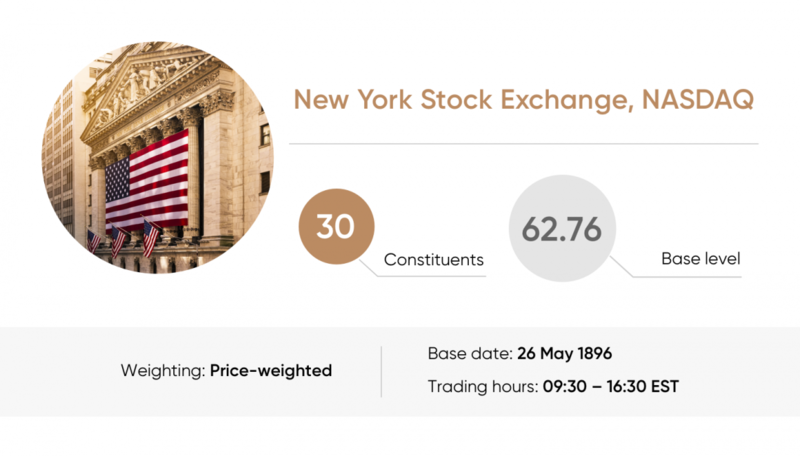 The stock market index comprises of 30 major US companies and industry leaders that are listed on the New York Stock Exchange (NYSE) and the NASDAQ. One of the most-watched and the oldest indices in the world, the Dow Jones has grown into a unique microcosm for global financial markets. Widely considered a benchmark of US stock market performance, the Dow includes some companies with the world’s largest market capitalisation, such as ExxonMobil (XOM) and Apple (AAPL). It’s the National Association of Securities Dealers Automated Quotations exchange, or simply the NASDAQ exchange – the first electronic marketplace, where investors trade stock on a high-speed and transparent automated platform. The NASDAQ also refers to several indices, including the NASDAQ 100 and the NASDAQ Composite Index. The NASDAQ 100 operates on the same basis as the DJIA and tracks the performance of a portion of the market, represented by 100 largest and most actively traded companies. All the constituents of the NASDAQ 100 index are listed on the NASDAQ stock exchange. How are the Dow and the NASDAQ calculated? The Dow Jones is a price-weighted index, which means that stocks with higher share prices are weighted higher within it. The DJIA is calculated as follows: the sum of the prices of all 30 index constituents is divided by the ‘Dow Divisor’. Over time the divisor is adjusted to account for additions and subtractions like mergers and stock splits. The NASDAQ 100 is a capitalisation-weighted index. It means that the companies which have a bigger market capitalisations have a greater influence on the NASDAQ index price. How to invest in the Dow Jones and the NASDAQ? The Dow Jones and the NASDAQ 100 usually provide traders with high liquidity, responding well to the volatility of American stock markets. Traders usually choose indices because they provide an opportunity to trade a wide cross-section of US stocks. It helps to protect your investment from a particular company’s volatility, while still providing exposure to the wider US stock market. One of the easiest and most popular ways to trade the DJIA and the NASDAQ 100 is with CFDs (contracts for difference). No matter whether you have a positive or negative view of the stock market forecasts, you can go long or short the market and try to profit from either upward or downward future price movements. Using CFDs, you don’t have to deal with conventional exchanges – you trade directly with your CFD broker. Though the meanings of the Dow and the NASDAQ are often confused, the main thing to remember is that they both refer to popular indices (DJIA and NASDAQ 100), but the NASDAQ also refers to one of the world's most famous financial exchanges.